Gary Mullen & The Works performs One Night of Queen on Saturday, March 3. When: Saturday, March 3, 7:30 p.m.
Harrah’s Lake Tahoe is the place to be this weekend for classic rock fans. 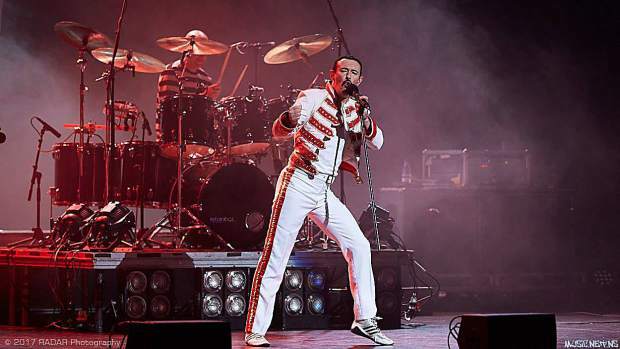 On Saturday, March 3, Gary Mullen & The Works presents One Night of Queen — honoring the music of the iconic rockers — beginning at 7:30 p.m. at the Stateline casino. Mullen leads the group with his portrayal of Queen frontman Freddie Mercury, a talent he began performing nearly two decades ago. “Gary has been a lifelong Queen fan and has always been a keen singer. His career as Freddie started in 2000, when his wife and his mother secretly applied to the Granada TV show ‘Stars in Their Eyes,’” states the entertainer’s online biography. Mullen won the show with more than double the votes of the runner-up, and went on to form The Works in 2002. Since then, their One Night of Queen show has gained recognition and performs over 150 times each year. Guests at least 21 years of age are invited to attend the South Shore performance. Tickets, which are standing room-only, begin at $35.77 (plus tax and fees). A beat-the-line option is available for $76.83. Purchases are conducted online via Ticketmaster. Harrah’s Lake Tahoe is located at 15 U.S. 50. Learn more about the gig online at http://www.ticketmaster.com, and about Gary Mullen & The Works on Facebook (@garymullenandtheworks) or at http://www.garymullenandtheworks.com.